This years' Web Summit in Portugal was, on the face of it, much like any other trade show or conference. 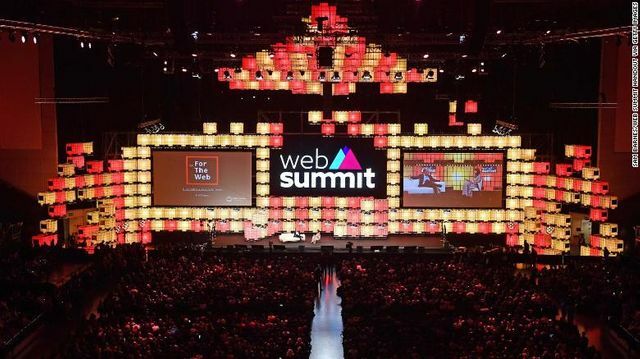 Over 70,000 attendees and 1,200 speakers crammed into four cavernous halls and one main stage area in Lisbon to hear about the latest tech trends and thought leadership. As is usual, there were 100s of stands with suppliers from over 160 different countries eagerly touting their wares, and there were more brightly coloured t-shirts with company names suffixed by "ly", "io" or "ai" than you could shake a stick at. And if you had a glass of the local wine for every time you heard the word "disruption", you would need to have been carried out of the event by midday on Tuesday (for the record, I *didn't* attempt this). But there was something different about this event. Talk after talk at Web Summit focused on the impact of technology and innovation upon society, for good and for ill. Whole conference programmes, like the Planet:tech stream, were given over to how technology may be able to ameliorate the effects of climate change or reduce our use of plastic. There were presentations from Ecosia's Christian Kroll, which has a search engine that uses Pay Per Click to fund planting trees, or Tipa Corp's Daphna Nissenbaum, who is trying to cut down industry's use of single-use plastic - which represents an alarming 80% of all plastic, most of which hits landfill. Major companies and investors like BP's Stephen Cook, Total Energy Ventures' Cindi Choi and Obvious Ventures' Andrew Beebe all talked about the substantial, multi-million and billion dollar investments they are making in sustainable tech. Toon Bouten of Tado, and climate control app from the home showed how Tado is saving households 22% of their energy consumption. At the same time, there was much discussion of how governments may need to regulate tech companies in one way or another. Tony Blair, former UK Prime Minister, talked a number of times at the event, and he proposed the idea of specific regulation and a dedicated regulator in the UK, and potentiality Europe. There was, admittedly, an entertaining moment of reflection when Tony Blair said "my children say 'don’t talk about tech, we have a vast accumulation of data to show you don’t know what you’re talking about'". But you would be hard-pressed to find a global leader who is more articulate and informed on the potential impact of AI on society, and the strides China is making to become the dominant global force in this area. Much discussion was given to the contribution "big tech" needs to directly make to the countries in which they operate. This comes a week after the UK Government announced a "digital services tax", and the week both the EU announced its own version of a similar legislation (leading to Google trending number one on Twitter throughout the day) and San Francisco passed its hypothecated "Prop C" tax on large tech companies to fund programmes to tackle homelessness. This was, interestingly, strongly supported by Salesforce CEO Mark Benioff. And it wouldn't be a discussion of tech's impact on society without mention of fake news. I'm not going to re-tread arguments you've heard in a thousand other blog posts, but this was debated between a tech company (Mitchell Baker of Mozilla), media companies (The Guardian and FT) and Government (the Government of Serbia). What was striking is that there was no consensus on what is needed to tackle this issue. What Web Summit definitely did show was that there is now a greater level of awareness of the societal impact of technology than I've seen at any point previously. If you communicate on behalf of a business in the technology space, you need to be prepared for more questions from stakeholders and media about your perspective on these issues. And don't think that you can avoid these by drinking a glass of the local wine every time you're asked. About 70,000 people attended the summit in Lisbon, Portugal, with a lot on their minds. The tech industry is facing more challenges than ever before — from regulation and hacking, to questions about funding and the trade war between the world's two biggest economies. "I definitely think the era of technology companies thinking it was good to move fast and break things is over," said Brad Smith, Microsoft's (MSFT) president and chief legal officer. Secretary-General @antonioguterres' message to the #WebSummit: I want the @UN to be a platform where businesses, technology companies, governments and civil society can come together and discuss ways in which cyberspace and technology cab be a force for good.